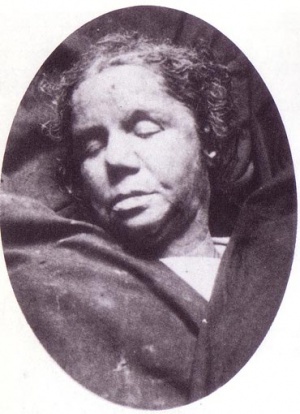 Mortuary photograph of Alice McKenzie. M'Cormack told an interviewer on Thursday that he first knew the deceased woman in London about seven years ago. She had not a friend in this city, but he believed she had a son, probably in America. Before he became acquainted with her she lived with a blind man who played a concertina in the streets for a living. M'Cormack "took up" with her because she was homeless, and appeared to be a hardworking woman. He had often heard her say she was the last of her family, and had often heard her speak of her father, who was a postman in Liverpool. M'Cormack never saw any of her relations. For several years he served in the army, and took part in the Crimean war, after which he was invalided, and received a pension for eighteen months. McCormack, an Irishman, was in the employ of some Jewish tailors in Hanbury Street as a porter. He shared lodgings in various doss-houses with his common-law wife for around six years, and their last cohabitation was at Mr. Tenpenny's Lodging House, Gun Street, Spitalfields. They moved there around April of 1888. The lodging house on Gun Street was managed by a Mrs. Elizabeth Ryder, wife of Richard John Ryder. While there, McKenzie was said to have worked for her Jewish neighbors as a washerwoman and charwoman, but the police considered her a common prostitute and she was known to have frequented the streets on occasion. At this time, Alice was around 40 years of age, described as a freckle-faced woman with a penchant for both smoke and drink, engaging more in the former than the latter. She preferred the smoke of a pipe, which was soon to grant her the name "Clay Pipe" Alice by her friends and acquaintances. Her left thumb was also injured in what was no doubt some sort of industrial accident. 4:00 P.M.: McCormack returns from his morning shift at work somewhat drunk and sets himself down in bed. He hands Alice 1s. 8d. to pay Mrs. Ryder for the rent, and a shilling to spend for other necessities. Alice left the room with the money, but did not pay the rent. 7:10 P.M.: According to the Pall Mall Gazette, Alice took a blind boy named George Dixon or Discon, another resident at Mr. Tenpenny's, to the Royal Cambridge Music Hall. Dixon would later testify that he had heard Alice speaking to a strange man, asking him to buy her a drink, to which the man replied, "Yes." Alice then saw Dixon home to Gun Street. 11:00 P.M.: McCormack emerges from the room and proceeds downstairs, passing Mrs. Ryder who informs him that Alice had indeed not paid their rent. 11:40 P.M.: A friend of Alice's named Margaret Franklin was sitting with two acquaintances (Catherine Hughes and Sarah Mahoney or Marney) on the step of either a barber's shop (Sugden) or a lodging house (Begg et alia) on Flower and Dean Street at the side connecting with Brick Lane. Alice passes the three ladies 'walking hurriedly' toward Whitechapel. Margaret asked Alice how she was doing, and she replied in the same hurried manner: "All right. I can't stop now." According to the three ladies, Alice was not wearing a bonnet, but rather a 'light-coloured shawl' around her shoulders. 12:15 A.M.: P.C. Joseph Allen (423H) takes a break under a street lamp in Castle Alley, just off Whitehapel High Street, for a bite to eat. According to Allen the alley was completely deserted. After about five minutes, Allen notices another constable entering the alley. 12:20 A.M.: Walter Andrews (PC) (272H) enters Castle Alley just as Allen is leaving. Andrews remains in the alley for about three minutes, and again he sees nothing of a suspicious nature. 12:25 A.M.: At about this time, Sarah Smith, deputy of the Whitechapel Baths and Washhouses (which lined Castle Alley) retires to her room. She begins reading in bed, the closed window of her room overlooking the entire alley. Sarah later testifies she heard nothing suspicious until she heard the blow of Andrews' whistle. 12:45 A.M.: It begins to rain in Whitechapel. 12:50 A.M.: Andrews returns to Castle Alley on his regular beat, about twenty-seven minutes having passed since he left the area. This time, however, he discovers the body of a woman lying on the pavement, her head angled toward the curb and her feet toward the wall. Blood flowed from two stabs in the left side of her neck and her skirts had been lifted, revealing blood across her abdomen, which had been mutilated. P.C. Andrews heard someone approaching the alley soon after, and ordered the man (Lewis Jacobs) to stay with the body while he went to fetch help. On a side note, a fellow prostitute and companion of McKenzie's named Margaret Cheeks, was also thought to have been killed along with Alice because she was not to be found for two days following the discovery of McKenzie's body. Actually, she had been staying with her sister at the time. The bruises on the chestal region suggest the killer probably held her down to the ground with one hand while inflicting the wounds with the other. The mutilations committed upon McKenzie were mostly superficial in manner, the deepest of which opened neither the abdominal cavity nor the muscular structure. The wounds also suggested that the killer was left-handed (as opposed to the Ripper being right-handed). Phillips suggested the five marks on the left side of her body were an imprint of the killer's right hand, which left only his left hand to facilitate the injuries. Dr. Bond disagreed, claiming there was no evidence to support the theory that those marks were made through such processes (admittedly, Bond saw the body the day after the post mortem, and it had already begun to decompose). The weapon involved was agreed upon to have been a 'sharp- pointed weapon,' although it could be smaller than the one used by the Ripper. After careful and long deliberation, I cannot satisfy myself, on purely Anatomical and professional grounds that the perpetrator of all the "Wh Ch. murders" is our man. I am on the contrary impelled to a contrary conclusion in this noting the mode of procedure and the character of the mutilations and judging of motive in connection with the latter. I do not here enter into the comparison of the cases neither do I take into account what I admit may be almost conclusive evidence in favour of the one man theory if all the surrounding circumstances and other evidence are considered, holding it as my duty to report on the P.M. appearances and express an opinion only on Professional grounds, based upon my own observation. I see in this murder evidence of similar design to the former Whitechapel murders, viz. sudden onslaught on the prostrate woman, the throat skillfully and resolutely cut with subsequent mutilation, each mutilation indicating sexual thoughts and a desire to mutilate the abdomen and sexual organs. I am of opinion that the murder was performed by the same person who committed the former series of Whitechapel murder. I am here assuming that the murder of Alice M'Kenzie on the 17th of July 1889, was by another hand. I was absent from London when it occurred, but the Chief Commissioner investigated the case on the spot and decided it was an ordinary murder, and not the work of a sexual maniac. I need not say that every effort will be made by the police to discover the murderer, who, I am inclined to believe, is identical with the notorious Jack the Ripper of last year. In fact, on the day of the murder, Monro deployed 3 sergeants and 39 constables on duty in Whitechapel, increasing the force with 22 extra men. The Scotland Yard Files pertaining to the McKenzie murder detail an interesting sidebar concerning an individual named William Wallace Brodie, who confessed to murdering the woman. It was earlier printed in the Kimberley Advertiser of June 29th, 1889 that Brodie had confessed to all the Whitechapel murders while in a drunken stupor. His statement was forwarded by Inspector Moore, but Inspector Arnold gave instructions to dismiss Brodie as of unsound mind. Scotland Yard gave the same prognosis: "Let him be charged as a lunatic." It was soon discovered that Brodie had a conviction for larceny, and just to be sure, enquiries were made into his character and location during the Whitechapel Murders. It was found that he was in South Africa between September 6th, 1888 and July 15th, 1889. Ultimately, Brodie was released from custody, but was almost immediately rearrested for fraud.